Installing this was easy as you can get. The software comes on a CD, pop it into your computer and a couple clicks later its ready to be synced with your palm. 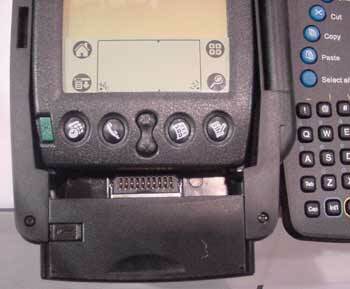 Sync it and the 16K application is loaded onto the handheld in a matter of seconds, even over serial ports. It's quite easy there. Then once you install the application, open the case, drop the door at the bottom, slip your naked palm 3 inside, close the door and lock the button. Fire up the palm, hit the "Type n Go" application and turn on the case. It's that simple. Overall it took me about 1 minute to get this working.